- As “Robinson Crusoe Isle” because it is believed that the references made by writer Daniel Defoe about his voyages as Robinson Crusoe had some references to Tobago. - Tobago was also known as the “Bone of Contention” because of the many wars that were fought by Europeans for its ownership. Even one village, Bloody Bay, was given its name because of one particularly fierce naval battle that was fought in its harbor. Considered a prized gem by European settlers, Tobago was craved for its fertile soil and its good waterways. Tobago is only about 116 square miles and, except for its sister island Trinidad, is the most southerly Caribbean Island. Originally, Tobago was inhabited by the Carib Amerindians who were indigenous to the smaller Caribbean Islands. It was discovered by Columbus in 1498, fought for and colonized by numerous European nations. With the use of African slavery and its fertile soil, Tobago became a major sugar producer for the European markets. Evidence of this still lingers in the presence of a huge Waterwheel on an old sugar plantation at Arnos Vale, Plymouth. 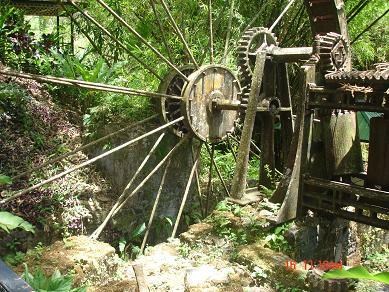 The Waterwheel is a permanent attraction as it sits on display among other paraphernalia used in the sugar production. A visit to the Waterwheel has become a popular tourist haunt. Tobago became a Crown colony of the British in 1876 and in 1889 became a ward of Trinidad. Trinidad and Tobago became an independent Republic twin island nation on 31st August 1962. Tobago was represented by 2 elected representatives in the Parliament and the central government was and still is located in Port-of-Spain, the capital of Trinidad. In 1980, the “Tobago House of Assembly” (THA) was created to manage the affairs of Tobago. The Tobago House of Assembly is located in Scarborough, the capital of Tobago. The winner of a free election of 12 electoral districts every 4 years gets to run the THA. The standard of living in Tobago is high and the natural beauty of the island and its people have attracted many foreigners to its shores. As a result, there was a housing boom that was enjoyed from the late 1990s to it’s peak in 2008. Consequently, real estate prices skyrocketed. As the global recession of 2009 severely impacted economies worldwide, Tobago, even though not impacted as severely as other countries, has also felt the blow of the global downturn. The torrid pace of construction on the island has slowed. This situation of the slowdown in construction is exacerbated by the fact that the government is the major employer on the island. As the recession has forced the government to lay off workers, many houses and other projects by the local residents have had to stop. Additionally, at this writing, new government projects have come to a screeching halt and only existing projects are being worked on. Governments by their very nature are woefully inept and inefficient employers. This is because government workers aren’t paid to be innovative - salaries are based on one’s position or title - not on innovation or productivity. Since the government is the major employer in Tobago, productivity is at a very low ebb. However, the hope is that change is on the way. Private enterprise is encouraged and small businesses are promoted. People are encouraged and educated to do business in Tobago by the Enterprise Development Program which is run by the finance department in Tobago.